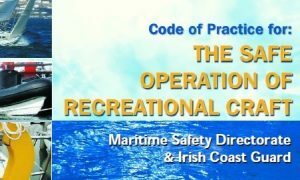 This booklet contains essential safety information on the operation of recreational craft. Safety is the primary concern for all persons involved in boating activities. Here are some guidelines provided by Irish Water Safety. Check condition of boat and equipment, hull, engine, fuel, tools, torch. Check the weather forecast for the area. Check locally concerning dangerous currents, strong tides. Carry an alternative means of propulsion e.g. sails and oars or motor and oars. Carry a first aid kit on board and distress signals (at least two parachute distress rockets, two red hand flares). Carry a fire extinguisher, a hand bailer or bucket with lanyard and an anchor with rope attached. Carry marine radio or some means of communication with shore. Do not overload the boat – this will make it unstable. Do not set out unless accompanied by an experienced person. Leave details of your planned trip with someone ashore – including departure and arrival times, description of boat, names of persons on board, etc. Wear a lifejacket at all times. Keep an eye on the weather – seek shelter in good time. In Marine Emergencies, call 999 or 112 and ask for Coast Guard. The 22°C warm weather forecast for the bank holiday weekend increases the risk of drownings as warmer air temperatures can tempt people to go swimming in waters that are still cold (10°C coastal, 8°C inland). Survival time is greatly reduced for someone immersed in cold water which drains body heat much faster than cold air. When cold water makes contact with your skin, the cold shock response causes an immediate loss of breathing control, possible dizziness and panic. This dramatically increases the risk of sudden drowning even if the water is calm and you know how to swim. For those who survive this but are unable to get out of the water, progressive body cooling leads to hypothermia and muscle cooling, making swimming more difficult or impossible. Children cool even faster than adults because they are smaller and have less fat. Avoid swimming, stay calm and relax. Float or tread water and if possible get as much of your body out of the water because you will always cool faster in water than in air. Wearing a lifejacket with a crotch strap will enable you to lessen heat escape by keeping your legs together and elbows by your side. A full moon on Good Friday will cause spring tides. Strong rip currents will create a higher risk than usual for swimmers. The tidal streams will run very strong, posing a risk to those boating, angling, yachting, canoeing and any other water related leisure activities. Stranding will also be a risk for many walkers as the lower tide will expose even greater areas of the coastline. Parents should be particularly alert to providing constant uninterrupted supervision as Lifeguards will not be on duty at local authority beaches over the Easter weekend. Those going afloat should carry a portable Marine VHF and/or a personal locator beacon and walkers should carry a mobile phone to call 112 in an emergency. If you have not used your lifejacket or buoyancy aid since last year then you will need to carry out the following checks.